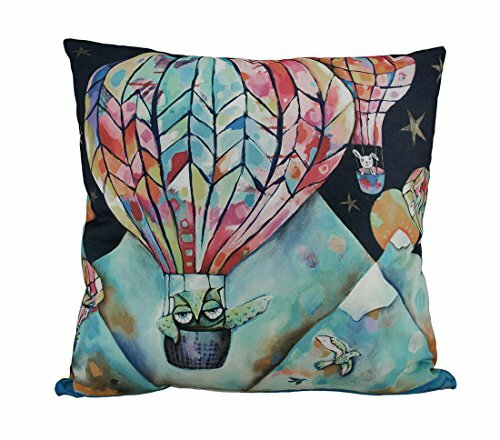 Bring the whimsically cozy style of Allen Designs to your home with this colorful Flight of the Animals throw pillow as they lift off in their hot air balloons to soar above the mountains and into the starry night sky on the reverse. It's made from 100% polyester materials with a cotton-soft cover sure to transform your drab space into a luxurious lounge-worthy place that maximizes your relaxation and brings a fun touch to your decor. The cover is easily removed with a hidden zipper on the bottom for machine washing; now that's comforting! Create your own cozy oasis in any room with a cozy pillow that adds a pop of color and cheerful comfort anywhere! If you have any questions about this product by Allen Designs, contact us by completing and submitting the form below. If you are looking for a specif part number, please include it with your message.